You may already know this but I’m posting this for posterity’s sake. John Carpenter (who I am a big fan of) has accepted to do the Darkchylde movie adaptation. Sweet! Down below I have collected the media published so far. Warning: Spoilers and plot points revealed. Read AFTER movie. I came out from this movie with a lot of different ideas about the symbolism presented in the movie, but I had no idea there were so many different ways to interpret it until I read the IMDB comments. I will not go into all the other interpretations presented here, but they are certainly worth reading. It’s a story about society, the mind, reality, death, pain, anxiety, love, art, hopelessness, fear and almost everything that can be put in a movie coherently. Not only is it a masterpiece, it was, to me, such a deeply profound movie that it opened up a whole new way of seeing the world, and reality. I believe most of the events and situations in the film represent abstract symbolic feelings and emotions that can be applied to our normal lives. The train scene can represent the anxiety about death, injury and the vivid imagination we can have about how we die or how scary violent and gruesome events can be. His life there can represent depression and alienation from the unknown world that we are surrounded with, and the train scene can be our fear of death that stops us from committing suicide and thus go back to our less than optimal lives. It also tells us reality is cruel in its neutrality, it does not know nor care about any living organisms in its path, and its destructive force can be brutal and unrelenting in its ignorance. We as humans must deal with this random reality, and we have to live with the pain and violence that may meet us at some point, and which does indeed strike many people everyday. The way the train stops when Andreas is lying on the tracks tells me even more about how cruel and random the world can be, it doesn’t just let you die, it rubs it in in the worst possible way. Andreas’ return home as a bloody mess only to be met by a neutral girlfriend who asks if they want to go go-karting can represent the feeling of despair we can feel inside, but are unable to communicate to others nor get a response from them. The hole in the wall can similarly be an abstract hope of all the good things one can experience, the positive euphoric possibilities granted by reality, which is not all bad, but all extreme poles of evil and bad, to good and blissful euphoria. Finally the finger cutting scene is a perfect example of how we have to experience every sensation – brutal pain included, and the desperate feeling of seeing your finger cut off (and the shocking surprise of actually realizing what is happening) but reality remains static and uneventful even so. You are alone, completely alone, in your experience. The movie tries to be neutral, the way I see it, but there is underneath the obvious dystopia, an even more fundamental despair. The fact that he is left in an icy snow world as an immortal is beyond cruel, because he will feel frost and solitude, but never die presumably. This can also symbolize how some people are completely rejected from society. The movie was to me extremely scary. It was among many things a psychological and existential horror movie. I am glad I saw it, but I also regret it, because ignorance can sometimes be a GOOD thing. There have been quite a few movies about mental illness, but most of them are dramatized and exaggerated for the sake of entertainment. 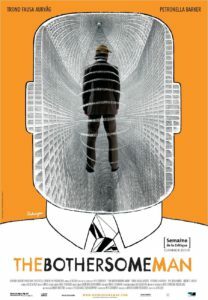 Revolution #9 is arguably the most realistic and most analytic-yet-entertaining portrayal of schizophrenia of them all. It accurately documents many different aspects of the deterioration of James Jackson, brilliantly played by Michael Risley and the people around him who are affected by his gradual shift into psychosis. James Jackson is engaged to Kim Kelly (played by Adrienne Shelly) who are supposed to get married in 6 months. It starts out with small episodes. He accuses a co-worker of moving things around on his desk behind his back to toy with him, and he ends up getting fired for writing reviews of websites he feels are out to send subliminal messages to him. His fiance’s brother has a son, 12 year old Tommy, who tells James about some hacker websites he visits and how they hack servers, and this triggers paranoia in James who consequently accuses Tommy and his boss at work of sending subliminal messages in emails and through websites. The confrontation between James and Tommy scares Tommy, and this is the first example of how schizophrenia doesn’t just affect the sufferer, but also the people around him. 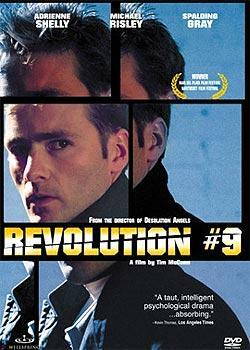 Building on the subliminal messages delusion, James sees a perfume commercial for a company called Revolution #9, and believes there are messages in the video, and eventually hunts down the director of the commercial, by talking to the perfume company and finding the production studio they hired. Upon uncovering the identity of the commercial’s director, a Scooter McRay (played by Spalding Gray), he calls Scooter and says he is a production company that loved the commercial and wants to use him for their own project. Now of course, this is just an ad commercial, and probably not the most creative or personal work from Scooter, who also makes a point to James that he is most known for his still photography. Scooter is a creative guy who never quite made it big-time, and in turn did a couple commercials to make a living, so when he gets a call from James he gets big hopes and thinks James represents a big company and big opportunities for him to take it to the level he always wanted but never did. So in another example of an innocent bystander being affected negatively by James’ delusions, he meets Scooter and ends up confronting him in a very irrational way, leading up to him attacking Scooter and putting him down on the floor. After James tells his fiance about the subliminal messages in the commercial, she instantly knows something is wrong with him, and contacts a psychiatrist, who after a confrontational meeting prescribes James to antipsychotic medication. His girlfriends family increasingly urges Kim to stay out and cut contact with James, but she loves him and wants to help him get better. After awhile he is consequently put under a court order to stay hospitalized for 2 weeks and to take antipsychotic medication. When 2 weeks have passed, James’ doctor gets a phone call from what looks like an insurance company manager who finances the institution, who asks how their patients are doing. The doctor tells the manager James has taken medication and calmed down, but that he has no insight into his illness and needs to stay longer. The manager, who is operating under financial regulations, asks the doctor if James has been violent to other patients or staff, because patients who are not violent cannot be forcefully hospitalized. Since James has not, he is released, and this shows how difficult it is to get treatment even if you are very sick and how this affects thousands of patents around the country every year. Now the acting is top notch across the board, which is impressive, especially since it is a very low budget film. Michael as James really shines in how he portrays his inner torment and confusion with just a mere look on his face, and his girlfriend Kim is also great as the confused but loving fiance. Every character in this movie shows depth and each one is their own facet of how such an illness can develop for the victim and the people around the victim. The director also shows some scenes where the light is exaggerated and the cutting is fast and disorienting to show how it could look for a schizophrenic patient. All in all a very interesting and well executed movie. After having 3 episodes of somewhat lackluster character development and seemingly shallow storytelling, to my surprise the last 2 episodes have been really good. We are starting to know these people and things are getting more interesting. It’s definitely worth checking out. So there was quite a bit of critique of the Pilot episode of The Event. People found it confusing and some had lost faith in this type of mystery show because of the debatable fail of the Lost finale. However, after watching 3 episodes, I think this has very little in common with Lost, and it could be very cool as the plot unfolds. The first episode set up the premise and the characters, and it did so at a fast pace with many flashforwards/flashbackwards type scenes. But as of the third episode, they severely toned down this style of storytelling, and the episode was more focused on specific events rather than trying to introduce everyone and everything. It is a somewhat complex plot, as there are many people involved and many different time periods. Sometimes it’s 2 weeks ago, 60 years ago, and the present. It feels more like the hidden conspiracies of 24 than Lost. While The Event has supernatural science-fiction elements, they are not as far fetched as in Lost. It is more based on alien technology, while Lost was more about the truly supernatural and fantasy-like. So far I am hooked. I will follow it into future episodes for sure. So after being completely oblivious to this show and wanting a Shadowrun show for years, the joy and excitement I felt when I saw Batman Beyond today for the first time cannot be explained properly in words. 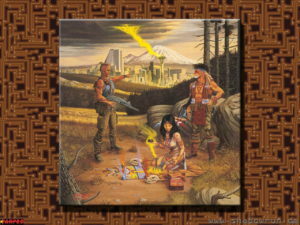 I was expecting a completely different atmosphere when I downloaded it, but to my surprise it was extremely close to everything I imagined a Shadowrun cartoon would have. There’s hover cars, charismatic memorable villains, dystopian-yet-polished like cityscapes, megacorporations and a dark vibe. There’s a very cool red/orange hue a lot of places, which adds a warmth not normally associated with Batman. 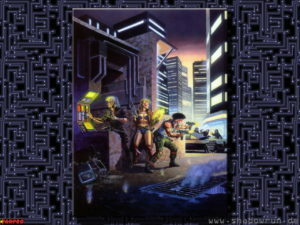 The stylized lines and coloring reminds me extremely of Shadowrun as seen below. I’ve seen this movie many times, and there’s something about the way it’s characters act and how they follow principle no matter how stupid or counter-intuitive it seems. Of course, this kind of thing can be seen in many American movies, but I will focus on ID because it’s the one I know the best. There are a few concepts that run through in these types of movies. First is love, and then there’s courage, honor and integrity and lastly foresight/insight that nobody else has. First up we have the MIT educated smart environmentalist who never quite made it, played by Jeff Goldblum, who is still in love with his ex-wife after 3 years, and wears their wedding ring. Typically, these types of characters are faced with negativity, this time from his father, who tells Jeff he should move on already. But in due American style, he doesn’t drop his hope that maybe one day he will have her back, and of course he never had another relationship because this proves his love is for her only. 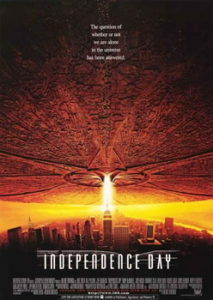 We later find out his ex-wife is using his last name in the phone book, and of course they end up together in the end. Courage and integrity is a big thing in America, and while there’s nothing wrong with that, it is also a bit naive because we are always expecting the hero to sacrifice himself for us. His integrity is more important than his life. Also, there’s the smart guy who ends up solving what nobody else could solve, and we root for him because we trust him and respect him. Usually these characters never make mistakes, ever. They usually end up in an argument over how outrageous it is or how it’s not going to work, but then it does work and the silent hero can smile. These characters are too perfect. Too inhuman. They always put their own lives secondary to everything else. They fearlessly go into deep enemy territory because it’s “the right thing to do” and us, the audience, are left with a distant hope that we ourselves can one day live up to this ideal. I dunno about you but I want to see a movie with some more flawed characters. I think Children Of Men did it quite good. The main character didn’t have hero qualities of epic proportions because it’s unrealistic. But I still admire this attitude. I remember back in 99 when I first bought this album. Before then I had only listened to trance and the common club hits, even Spice Girls. I hadn’t learned about all the great music out there. In comes Orbital, and blows my mind away. For a year straight. On my way to school. I had it on literally 24/7 and it really opened up my music taste. So naturally, this review isn’t technical or analytic, because the CD is pure emotion to me. In retrospect of course I enjoy the high attention to detail, the way every track oozes of effort and talent, but at the time, I had no clue about such analytical things. The CD shoots off with “Way Out”, where trumpets and synth lines morph away in complicated matters, and a beautiful repetitive melody comes into play. 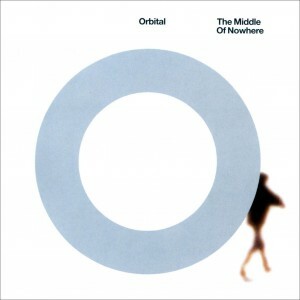 Orbital always loved those long evolving tracks, and this CD is no exception. All the tracks feel like a journey on each own, where usually there is a first section, second section and then back to first section. With all the sounds and small things they put in I can’t imagine the amount of work needed to sequence it all, but even so it never gets overpopulated or too messy, all the sounds are placed well and work well. Now naturally in a review, the reviewer is supposed to compare it to earlier albums. And while I agree that this can be fruitful, in this case Middle Of Nowhere is just different. It’s different in the way that they no longer have as much a theme or a concept with the album as they did on Snivilisation or In Sides. It’s music for music’s sake so to speak. It’s all about the sounds, the arrangements, the climaxes. The title ‘Middle Of Nowhere’ with a pure white cover sort of gives this away before listening to it. Oh the joys of 90s television.. Before CGI became ultra-realistic and took precedence over story and content (see: Avatar), there were made several TV series with low budget, that still remained fantastic. 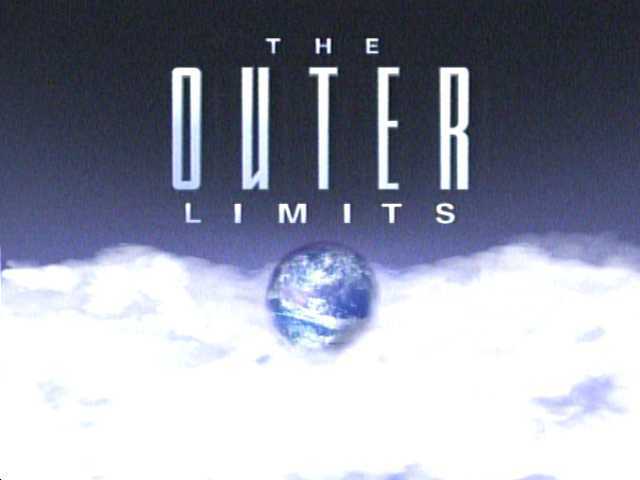 One of those shows was called ‘The Outer Limits’, with 90s charm and clever twists. The show focused on 1 hour science-fiction gems, where every episode ended in an unexpected twist. There are different characters and leads in every episode, similar to The Twilight Zone. 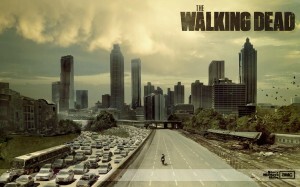 In retrospect I appreciate this show even more because nothing like it has been or is being made. The visual effects, while basic and primitive in many ways, also provided a completely unique atmosphere to the show. Who can forget the last frame of one episode where aliens had taken over the world and an alien had sat itself on the president’s head in the Oval Office while the shot faded out with a view of Washington DC in ruins? The show just plain worked. And even though it was a sci-fi show, it was also completely rooted in human social relations and societal critique. Many ideas and concepts could be applied to real life occurrences, and while the show could be called ‘crazy’, it never strayed away from its inner human core. This is a show I highly recommend to any sci-fi fan, and luckily for us, all 7 seasons of it is on hulu.com for free!